In an exclusive interview for the Czech Security Magazín German Lieutenant General Jörg Vollmer, current Chief of Staff of the German Army, answered to a criticism of the Infantry Fighting Vehicle PUMA (by PSM) which is one of four contenders within the large Czech Army's acquisition process, together with the ASCOD (by General Dynamics, the CV90 (BAE Systems) and the Lynx (Rheinmetall). At the same time the German Ambassador, Mr. Christoph Israng, gave another interview to the Seznam Zprávy in which he defended the policies by the German administration, and expressed hope the good neighbour relations and partnership between both countries can continue and develop despite differencies given by the migration crisis solutions. 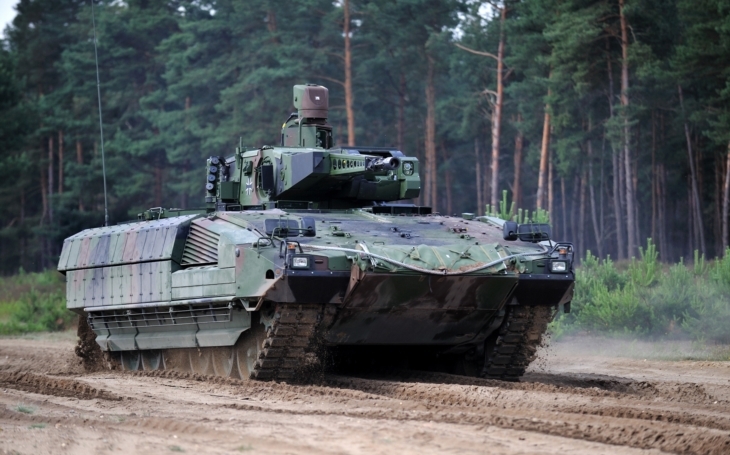 The PUMA Infantry Fighting Vehicle, designed to replace the aging German MARDER IFV, has been presented as possibly the most advanced IFV among the vehicle considered by the Czech Army to replace the aging BMP-2. At the same time it appears to be the most expensive one, and several Czech military experts published articles on vehicle's disadvantages, including limited interior space preventing tall soldiers from being deployed with the vehicle, limited capacity to only six troopers while the Czech Army requires eight for tactical reasons (two full teams of four). Among the disadvantages the experts mention also the unmanned turret mounted with a Rheinmetall 30 mm MK 30-2/ABM autocannon, as the vehicle lacks the possibility to be mounted with stronger calibers. Lieutenant General Vollmer adressed these reproaches, saying precisely the stabilized cannon was actually the most important advantage of the vehicle. It appears the German authorities, with the acquisition process taking shape, begin to defend and to promote the products of the German defence industry, and try to build an objective image to answer the negative information which prevailed in the Czech media so far. General Vollmer, how do you like the NATO Days in Ostrava? It is my first time here at the NATO Days in Ostrava, supported by Germany for many years, and I am excited how everything was put together. I am also excited by the number of people interested. I believe such event is important so we can present the armed forces and what we do, because we do it for our population. What do you enjoy the most here in Ostrava? I do enjoy, and I see it wherever I go here, the engagment of our troops. And the engagement of all nations present. We, together as NATO partners, ensure the safety of our population. Our troops serve with such engagement, and you can feel it from everyone you speak to, which is something really delightful. Let's concentrate on the Infantry Fighting Vehicle PUMA, which is right here with us. There was an information in the Czech media saying the PUMA has an issue with tall soldiers. What's the reality? PUMA has been designed so it could be transported with A 400M, our military transport aircraft. Which is why we had to give it a specific size. This size had an influence, we decided the protection for our soldiers is an absolute priority, which meant the allowed exterior outline reduced the interior space. The influcence is that only soldiers of a specific height can get on this vehicle, we both would be fine, as the height is 1,83 meters. And that's what has been published. So far our solution is to deploy soldiers who answer this limitation, which is the first step of our solution. The next step is we are working on a technical solution to move the seats a bit lower, and to get a few centimeters more. One solution is the height, the other solution is technical. Another criticism said the PUMA was equiped with black and white displays. We decided we would like to deploy this vehicle in any temperature - from extreme hot to extreme cold - which was why we used monochromatic displays, which work the best within such temperature range. And now, within the following optimalization of the vehicle, we decided to change the monochromatic displays with colour displays. Let's look at the vehicle from the other side: what makes this vehicle extraordinary? The difference begins up there with the cannon. The cannon is stabilized. Which means that even when the vehicle is moving, the cannon always aims at the same target, thanks to the stabilization system. This cannon can do the same thing as our cannon of different caliber mounted on the Leopard tank. It can hit its target on the run, no matter whether it is forwards, whether it aims to the side or whether it moves backwards. The target is hit and the ability of this cannon to hit the target with the first shot is impressive. It means the first big advantage of the vehicle is the cannon. We always value the ability to hit with the first shot, and this vehicle performs the same on the run as well as from fixed position. Of course the targed will be marked by laser. So the cannon is the first and main advantage. The second advantage of this vehicle is the armour protection, which is reactive and extensive as you can see, so we ensure the best protection for our soldiers. In principle, and this is essential, with this infantry fighting vehicle we can support the main battle tank Leopard in mobile combat. On the contrary the Marder, which is 40 years old, is too slow to support the Leopard in any combat situation. PUMA can do it, and PUMA and Leopard operate always together. How important is the safety of soldiers inside the PUMA vehicle? For us this is the most important criterion, because we want to have the best possible protection for our soldiers. We get it through the protection system of the vehicle. It can be deployed with two protection configurations. One lacks the external amour, yet the vehicle still offers high level of protection, the second one is normal for combat, as you can see here, with reactive armour. It makes it the best protected infantry fighting vehicle in the world so far.